Aziz Ansari approves of Park-z and Kanye-ation, a new Tumblr that pairs lyrics from Kayne West’s and Jay-Z’s collaborative album with scenes from the hit NBC sitcom. First, some clever pundit used Kanye West lyrics to caption New Yorker cartoons. Next, a Tumblr blog that mashed the Chicago rapper’s lyrics with screen shots from ‘90s sitcom Saved by the Bell amassed a following. Then, a crafty Etsy dealer started stitching and framing Weezy’s notoriously absurd tweets. Now, Parks and Recreation is the latest spin-off to get the Kanye treatment with a two-day-old blog named Park-z and Kanye-ation. Photos of memorable Parks events are paired with the often NSFW lyrics from Watch the Throne, West’s blockbuster collaborationwith Jay-Z. The blog took off today after Aziz Ansari, an actor and comedian on the show, linked to it on Tumblr. Each of the blog’s five posts have since accumulated hundreds of likes and shares. 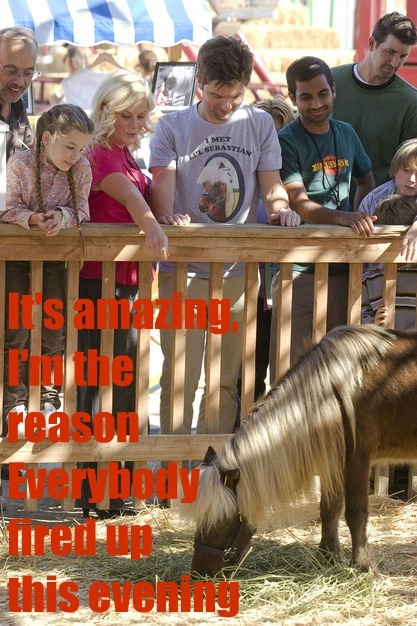 Parks and Rec meets the Throne?? Are you serious right now? This is amazing. Well done again Internet savvy Parks fans. I’m honestly kind of tearing up right now. We suspect that this buzz is just the beginning. Although Tumblr keeps each blog’s number of followers private, we know know Ansari has a million followers on Twitter. If he has half as many on his Tumblr, Aziz is Bored, they’re bound to check out Park-z and Kanye-ation. This is likely what the blog’s creator, David Diviny, had in mind. An Australian living and working in Hanoi, Vietnam, Divinity called out Ansari on his new Twitter and links to Kanye’d by the Bell, Watch the Cradle, and Aziz is Bored on the blog’s masthead. (He could not be reached for comment.